Madchester was the name given to a local scene that influenced a nation at the end of the 1980s and at the beginning of the 1990s. It made Manchester the most influential musical city in Britain, a reputation that lingered long into the 90s. Above all, it brought together two completely separate strands of music – indie and acid house – and forged them into something new and exciting that appealed across the entire spectrum of alternative music fans. Bands like the Stone Roses and Happy Mondays became vital figures in this new music, and their explorations had a trickle-down effect that ran into the Britpop explosion that would happen a few years later. The roots of the Madchester scene lay in the music of groups like the Smiths and New Order, who took the local indie scene national in the 1980s. They’d made people sit up and look at what was happening in the city, but more importantly, they’d been quite exploratory in their approach to music, staying well outside the jangly guitars that characterised most indie music. The city also boasted the Hacienda nightclub, one of the most prominent in Britain, which mixed indie with disco, and then the house music coming out of Chicago and Detroit. As the warehouse party scene began, it became a natural centre for the new music, fuelled by the use of Ecstasy. The young bands that would transform Manchester into Madchester were already thriving concerns when the acid house scene arrived. However, the only one to have made any impact was Happy Mondays, who’d already released records on the Manchester independent label Factory Records. Much credit, too, should go to New Order, who’d been pioneers in merging indie and dance music with records like Blue Monday (which they’d re-record in 1988), and undoubted influences on their younger colleagues. 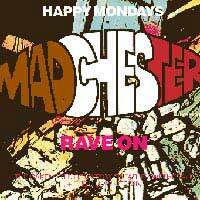 It really wasn’t until 1989 that things began to gel, although late ‘88 saw a couple of good singles (notably Happy Mondays’ Wrote for Luck) trickling out of Manchester. The bands seemed to have absorbed the sensibility of rhythm from the dance scene – a freer rhythm than rock – as well as the vibe of clubs like the Hacienda. But the first real indication that something new and different was happening arrived with the debut album by the Stone Roses, which even today is still considered to be one of the best and most important first albums ever released. Immaculately produced, it showcased some powerful songwriting, and a slightly psychedelic mix of rock and dance music that was very infectious. The album was followed by singles from both Happy Mondays and Inspiral Carpets that confirmed the influence of dance music on the Manchester sound, although each band has its unique take and inspiration. This set the template for the music that would emerge over the next two or three years. Initially the bands were Mancunian, such as the three above or James, but soon it had spread across Britain, with varying degrees of success. The musical style became known as “baggy” for the clothes many of the musicians wore, with wide flared trousers and very retro 60s fashions. Things probably reached a peak at the end of 1989, with singles by the Stone Roses and Happy Mondays finding their way into the charts, and onto Top of the Pops. That’s not to say Madchester suddenly began to define the pop scene; it still only represented one, more adventurous end of the spectrum, but it was one that was extremely influential on other musicians. The high point lasted for a year, with Happy Mondays, James and several other bands, including the Charlatans, continuing to releasing singles that made the charts. It was really drug and legal problems that caused the Madchester scene to sputter and die. Happy Mondays took two years to make their next album, reputedly because of internal bickering and drug problems, whilst the Stone Roses, tangled in litigation with their record label, had to wait almost five years to release another record. With the momentum gone from its two leading lights, the spotlight began to turn elsewhere, and although other bands on the scene continued to record and issue music, it simply didn’t have the compelling quality to sustain the scene.